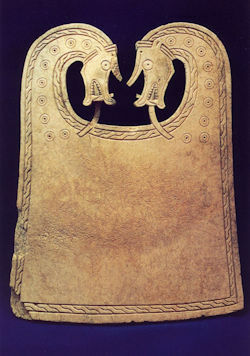 Bone and antler objects occur throughout the Viking world. Bones of pigs, cattle, horses, goats were used, and antler came from deer or elk. Needles and pins could be produced in a different shapes and sizes to serve a variety of purposes such as sewing clothes, nalbinding (a Scandinavian technique for making a strong, elastic fabric), net-making, securing a cloak, etc. Other products included spindle whorls, weaving tablets, needle cases made from small long hollow bones, knife handles, strap ends, gaming pieces, bone flutes, and ice skates. Combs were also made and could be quite basic (such as the comb from the boat burial at Scar, Orkney), or very ornate and decorated. Even the basic combs required considerable work, as the teeth can to be cut separately into bone plates which were fitted into the handle pieces. Whale bone could be used for special objects such as the decorated linen smoother from the Scar boat burial. While whale teeth and walrus ivory could be used for objects such as the Lewis Chessmen.